Lung transplantation is a surgical procedure for patient diagnosed with a end-stage lung disease. A lung transplant is a procedure performed to remove single or both diseased lungs from patient and replace it with a healthier one from the Donor. The majority of lung that are transplanted come from deceased person/organ donors, this transplant is called a cadaveric transplantation. Healthy, nonsmoking adult who makes a good match may be able to donate a part of one of their lungs. This transplant is called a living transplantation. Individual who donate a part of a lung can live healthy life with the remaining lung tissues. Free Medical Opinion from Best Lung Transplant Surgeons in India upon receipt of Medical reports within 24 hours. Most Affordable Treatment Packages from World-Class Centres for your Quality Treatment. Quick Medical Visa Assistance for Patient, Donor and Medical Attendants. Arrangement of Complimentary Airport Pick Up, Fixing an Appointment with the Treating Doctor and Booking of the Hotel/Guesthouse nearby the Hospital prior to your Arrival. Dedicated Case Manager for your personalized assistance during your stay in India. “No Extra Cost”, All Payments directly to the Hospital by Visa card, cash & Wire Transfer etc. Free Follow Up Services after your Departure from India. 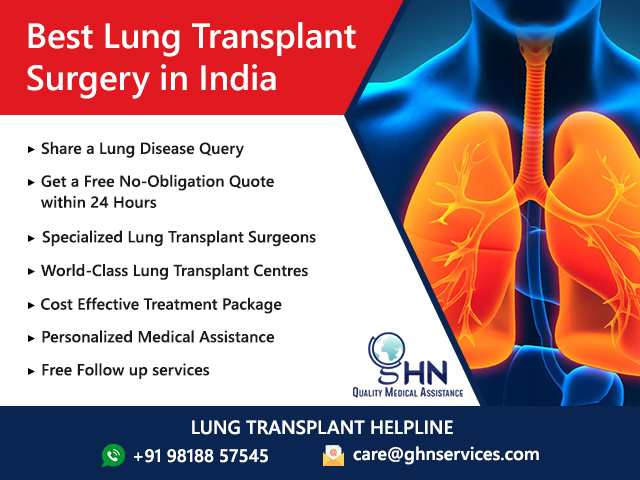 There are Various types of lung transplant procedures which includes single lung, double lung, bilateral sequential or bilateral single and heart-lung transplantation. The type of procedure performed depends on the condition of the recipient Patient. Scarring of the lungs (pulmonary fibrosis). Please note that the Lungs damage can often be treated with medications or with special breathing devices, But when these measures no longer help a patient or lung function becomes life-threatening, A doctor might suggest a lung transplant. Size of organ compared with chest cavity. Geographic distance between donor and recipient. Severity of the recipient’s lung disease. It may take few months for a suitable donor to become available, Patient should be ready at all times with arrangement of transportation to the transplant Hospital in advance. Patient may be expected to arrive at the hospital within just few hours. Once Patient arrives at the Lung Transplant Centre, Patientwill need to undergo tests to make sure the lung is good match and Patient are healthy enough to have the surgery. We provide the Best Heart-Lung Transplant treatment in India / We have the Best Hospitals for Lung transplant in India / Best Doctor for Lung Transplant in India / Quality Treatment for Lung Disease in India / Best Doctor for Lung transplant in India / Best Lung disease Treatment in India / Best Asthma treatment Hospital in India/ Best hospital for Lung Disease treatment in India / Low Cost Lung Transplant Surgery in India / Best hospital for Lung disease treatment in India/ Most Affordable Lung Transplant in India / Best Lung Transplant Specialist in India / Lung Transplant Specialist Doctor in India / Cost of Lung Transplant in India / Cost of Lung Transplant in Chennai / Cost of Lung Transplant in Delhi / Cheapest Lung Transplant Surgery in India/ Best Asthma treatment Hospital in India / Best Lung transplant Center in India / Best Heart-Lung transplant center in India / Best Doctor for lung disease in India / Cheapest lung transplant Center in India / Affordable Lung Transplant in India. Indian Hospitals and Doctors are well known for their excellent work in the field of Lung Transplants with a high rate of Success. GHN is dedicated in Serving Patients from all over Africa, Middle East, CIS and SAARC Countries etc.